More insider information has leaked out in the midst of the 'Sony Hack', and this time it revolves around notoriously picky actor Ryan Gosling. While he was said to previously be up for a role in Warner Bros.' Suicide Squad movie and the lead in Marvel's Doctor Strange, it has now come to light that he may have been holding out so that he could appear in one, if not both, of Sony's biggest franchise movies going at the moment. Ryan Gosling has been a hard actor for studios to lock into a genre movie, as he prefers more serious cinematic storytelling. It has also been rumored that he doesn't want to get locked into a longterm contract, which is said to have kept him away from Doctor Strange. But the actor reportedly wants the lead role in the Ghostbusters reboot. He is rumored to be keen to work with the studio after having a meeting with Sony co-chairman Amy Pascal. The problem is, Sony actually wants Ryan Gosling to star in their Spider-Man spinoff The Sinister Six. The email leaks go onto reveal that there is only one male lead character in director Paul Feig's Ghostbusters reboot. As reported last night, the emails also indicate that Paul Feig is set on having Emma Stone and Jennifer Lawrence as his two main female leads. It has recently been revealed that Sony is planning to completely reboot their Spider-Man franchise, with a story that focuses on a more adult Peter Parker. 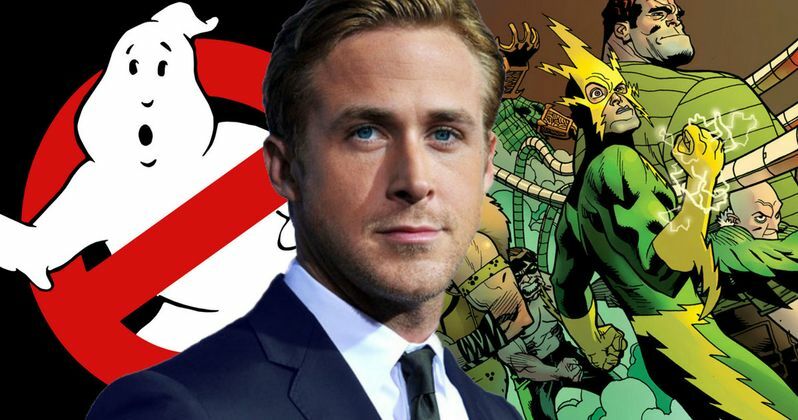 Its rumored that Ryan Gosling may actually be up for that role in The Sinister Six. Though, it is interesting to note, at 34 years old, Ryan Gosling is only three years older than Andrew Garfield, who has reportedly been fired from the franchise.